Diaper covers have become very fashionable with the infant set. Create your own crocheted cover using yarn left over from other projects. If you have a basic grasp of crocheting, you can make this pretty diaper cover for your own baby or as a gift for a newborn. To download this free pattern, click on the image or the image caption below. The Adobe printable pattern will open in a new tab or window and you can either download it to your computer or print it out. Giraffe diaper cover: You can get this unique giraffe hat and diaper cover set at All Free Crochet.com. What a cute idea for a baby shower gift that is very easy to make if you know single crochet and double crochet. 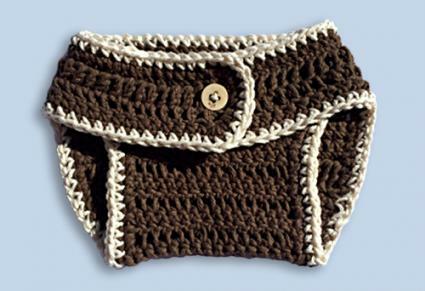 Fancy diaper cover: This free pattern from Craftsy makes a basic diaper cover that's fancied up with contrasting trim. 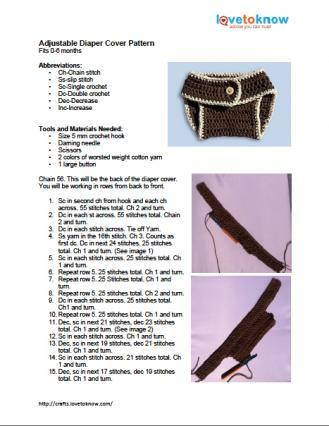 This is best for intermediate level crocheters. Country diaper cover and hat set: This adorable pattern will dress up any outfit you put on your baby girl, and it's fairly simple to make. You can make just the frilly diaper cover or opt to crochet the matching hat for a cute set. Diaper covers are the perfect way to hide a diaper and add color to any outfit. Make several in different colors so you can always have your baby in co-ordinating fashions.